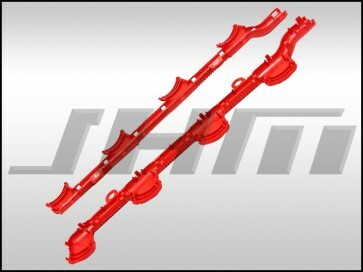 This is the 2-piece Coil Pack Wiring Harness Protector or Conduit for the wires and coil pack connectors on the Passenger Side Valve Cover of your B6-B7 S4. The original protectors on the car often become fragile and brittle due to age and heat. This causes them to crack or damage easily leaving critical coil pack and ignition wires exposed. These are a great item to consider replacing when changing spark plugs or your coil packs. NOTE: Priced each and side specific. This is the passenger side protector. If you need the driver side, go back to the Engine and Performance or Body and Electrical sections and add it to your cart. You can also search the site for "coil pack harness driver". The OEM Part Number for this piece is: 4Z7971824A or 4Z7 971 824 A.